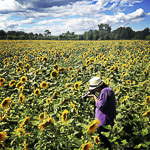 I recently returned from The Recontres d’Arles – the largest photography festival in Europe. This year was my 11th year in attendance and each Summer I also invite a group of adults to accompany me there and throughout various parts of Provence as part of my program “Photography in France”. This year’s festival was full of more than 50 exhibitions sprinkled throughout the gorgeous roman city and even more as part of the “Off Festival” which runs parallel programming to the Rencontres. Over the next few weeks, I’ll be sharing some of my favorite artists beginning with Gideon Mendel’s startling long term project Drowning World. Using photography and video, he has documented nine different floods along with their victims in eight different countries. Below are just a few of the images from the powerful exhibit – a project which equals 56 in all. Visit his website link below to see more images and also watch the powerful video below of his process and subjects. The project began in 2007, when I photographed two floods that occurred within weeks of each other, one in the UK and the other in India. I was deeply struck by the contrasting impacts of these floods, and the shared vulnerability that united their victims. Since then, I have endeavored to visit flood zones around the world, travelling to Haiti (2008), Pakistan (2010), Australia (2011), Thailand (2011), Nigeria (2012), Germany (2013), Philippines (2013), UK (2014), India (2014), Brazil (2015), Bangladesh (2015), and the USA (2015). The Submerged Portraits are at the heart of the Drowning World project. My subjects often invite me back to their homes, and to get there we travel together through deep floodwaters. In these dystopian and disconcertingly abnormal environments, I try to make the moment when I press the shutter calm and connected as I engage with my subjects. My intent is for their gaze to challenge the viewer and be part of a shared portrait of humanity in crisis in the face of natural disorder—a disorder than humankind has played a role in precipitating. Next Post Artist Spotlight: AIF’s Akram Zaatari “Against Photography. An Annotated History of the Arab Image Foundation”.